David Edison was born in Saint Louis, Missouri. In other lives, he has worked in many flavors of journalism and is editor of the LGBTQ video game news site GayGamer.net. He currently divides his time between New York City and San Francisco. The Waking Engine is his first novel. 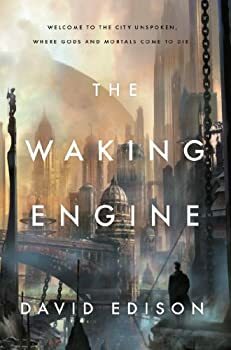 The Waking Engine, by David Edison, continues my unfortunately long-running streak of books that fell short of their potential. As with many of them this past month or so, The Waking Engine has a great premise — people (defined very broadly) do not die just once; instead they do so multiple times, each time waking in a new body to a new life on another world, but with all their memories intact. Eventually, however, you’ll end up in one of a few places where True Death occurs. And one such place, the City Unspoken, is the setting for Edison’s novel, which opens (after a short prologue) with the main character, Cooper, awakening in the City after only his first death, a highly unusual occurrence.